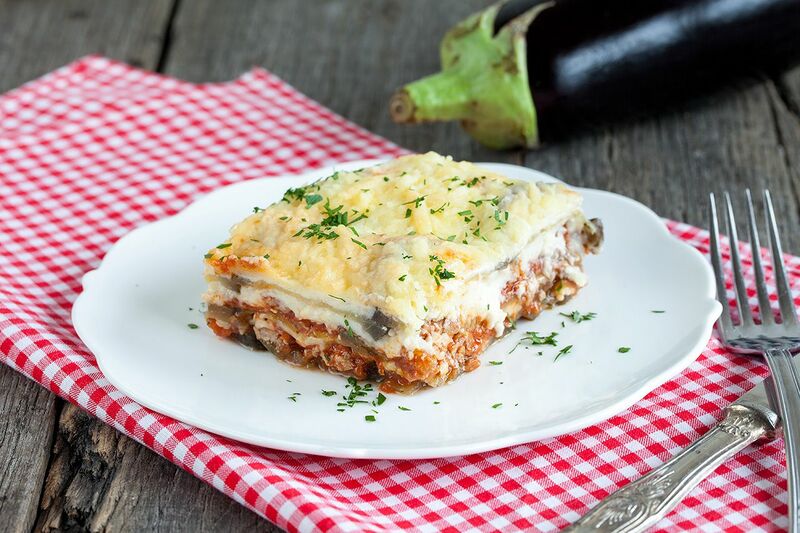 Classic greek moussaka has absolute amazing flavors, the combination of bechamel sauce, minced meat and eggplant is to die for. Want a bite? You can use a mandoline, but you can also cut the potatoes and eggplant in thin slices using a chef’s knife. PLACE the eggplant slices in a colander en add fine salt to it, this will get all the moist out of it to get more flavor from the eggplant. Don’t forget to set the potato slices into cold water to prevent discoloration. Meanwhile, create a bechamel sauce, in our how-to you can read in details how it’s made. Click here for the detailed post. You can read the short version below. CUT one peeled onion in halve and use the cloves to pinch the bay leave to the onion. This way you can easily remove the onion, bay leave and cloves from the milk later on. HEAT milk with the onion in the small saucepan on low heat. In the medium-sized pan melt the butter, when the butter has melted add the flour all at once. STIR and let it cook for a few minutes, then let it cool off completely. ADD the hot milk (don’t forget to remove the onion first) to the cooled of butter and flour mixture (that’s called a roux) and keep on stirring with a whisk. Let it cook on low heat until you’ve reached the desired thickness and season with pepper and salt. FINELY CUT the rest of the onions (2,5 onion) and garlic cloves and set aside. PRE-HEAT the oven to 190 degrees celsius or 375 degrees fahrenheit. HEAT olive oil in the large skillet and add the chopped onion. ADD the minced meat and cook until golden brown, that will take about 3 to 4 minutes. ADD the chopped garlic, ground cinnamon and cayenne pepper. COOK for another minute and then add the canned tomatoes. Let simmer on low heat until most of the moist has evaporated. Season the sauce with pepper and salt. PAT the eggplant dry using paper kitchen towels and drain the potato slices. Now create layers in the oven dish. 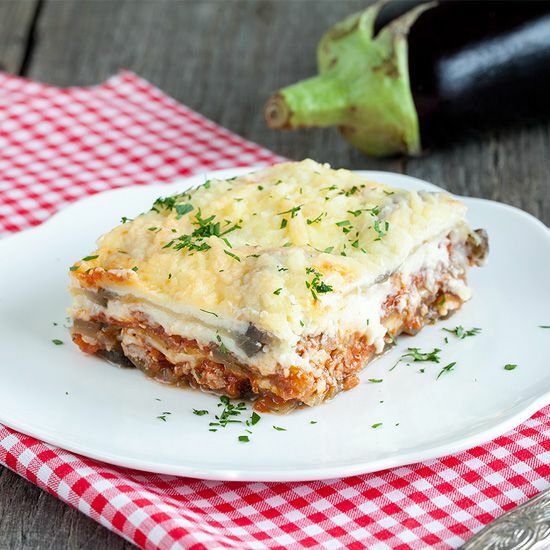 Start with a layer of eggplant slices, minced meat mixture, potato slices, bechamel sauce and some grated cheese. Repeat and finish with a layer of bechamel sauce topped with lots of grated cheese to create a crispy top. 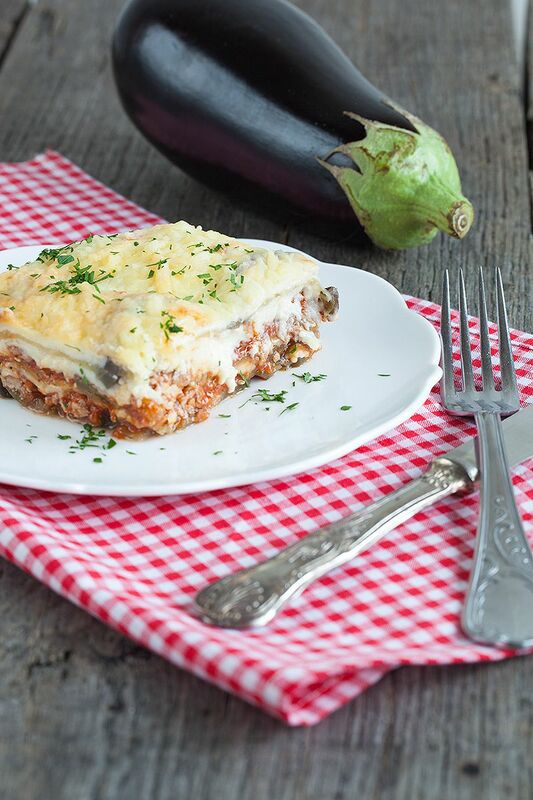 BAKE the greek moussaka in the oven for about 45 minutes until the eggplant and potato are tender and the cheese has a beautiful golden brown color. Garnish with some chopped parsley if desired. Enjoy your meal! 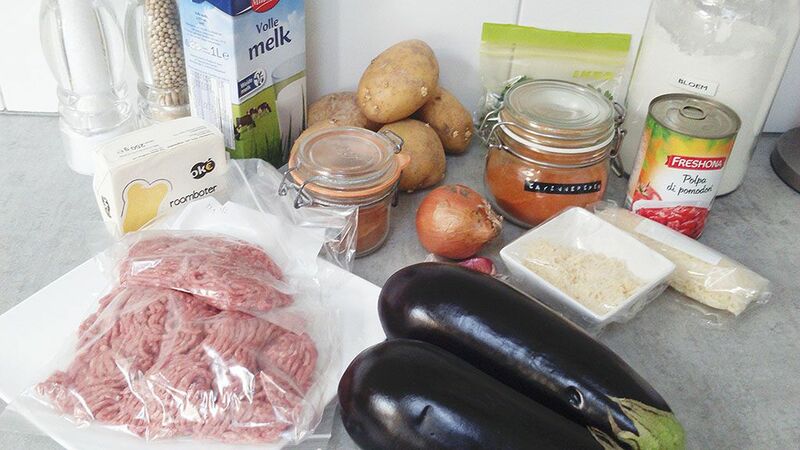 I love a classic & comforting moussaka. This recipe is definitely perfect for the winter here in Australia now – thanks for sharing it! Oh,this looks so good! I love moussaka, but haven’t eaten any in ages. I think this will make it on my cooking list very soon.